Jay Em, Wyoming began along a watering hole on the old Texas Trail that ran north-south through Goshen County. The land around the townsite was originally claimed by James Moore, a former Pony Express rider and rancher in the 1860s. By 1869, Moore had the second largest cattle ranch in Wyoming Territory, under the brand “J Rolling M”. A small stream was on his land was named Jay Em Creek. Moore died in 1873, but his brand continued to live on. On February 13, 1899, a post office was established on Jay Em Creek a short distance from the future site of the present town of Jay Em. The postmaster was William “Uncle Jack” Hargraves, and the post office went by the name of Hargraves. Uncle Jack was an unconventional person with decided opinions of his own. The story goes that there came a time when the U.S. Postal Inspector called on Uncle Jack and their opinions clashed strongly. Whereupon Uncle Jack informed the inspector that he could pack up his post office and get out; which is exactly what the gentleman did. Since the materials and supplies pertaining to the post office were all contained in a large wooden box, packing up and getting out was not a very difficult task. This left the ranchers and settlers with no post office nearer than Rawhide Buttes Station or Fort Laramie for the next ten years. 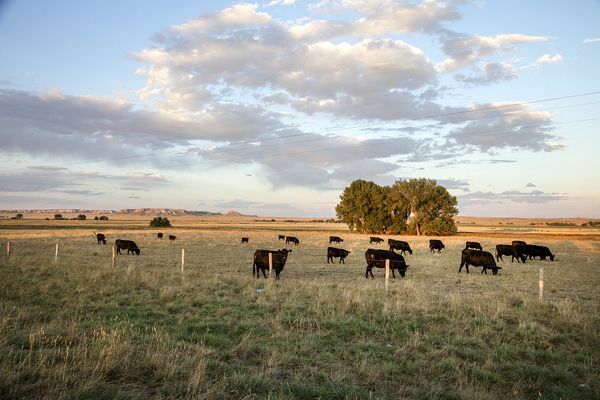 In 1905, Silas Harris and his three sons, Art, Lake, and Frank, from Wisconsin, took over the Jay Em Cattle Company. Three years later, in 1908 Silas Harris sent a request to Washington D.C. to have a post office established in the area again. They replied that if the family would bring the mail from the Rawhide Buttes Station to Jay Em Ranch, free of charge, every other day for 90 days, the post office would be established. 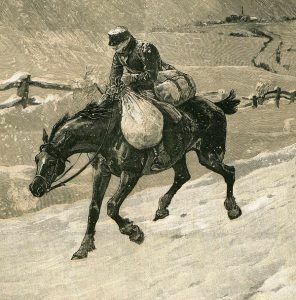 Silas’ son, Lake Harris, made the 20-mile round trip for the three months it was required. Upon receiving approval for the post office, the equipment was set up in a bunkhouse at the ranch. On February 10, 1909, Elizabeth Thornton, a friend of the Harris family, was appointed postmistress. In addition to the post office, the Harris family maintained a small general store on the Jay Em Ranch. 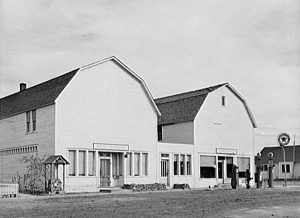 The “Silas Harris Company Store” sold general merchandise to area farmers and ranchers, provided rudimentary banking services, bought farm produce, and became a gathering place for homesteaders and cowboys alike. In 1912, 21-year-old Lake C. Harris, filed for land under the Homestead Act on an empty stretch of prairie along Rawhide Creek. He first built his own house and then operated a feed store in the ranch bunkhouse, which soon became a general store. When he was appointed postmaster in 1914, the post office was moved to his store. In addition to homesteading, Harris immediately began to establish a town to support area ranchers. He called the new townsite Jay Em, after Jim Moore’s J M Ranch. A weekly newspaper called the Jay Em Sentinel and Fort Laramie News ran from 1917 to 1921. 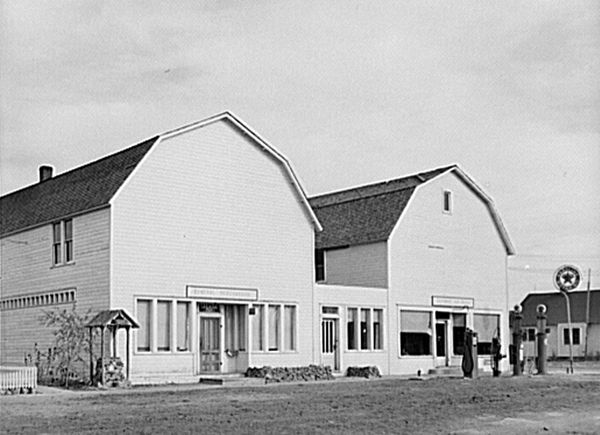 The Harris general store was moved from the ranch to the new townsite in 1918. Other businesses were also established, including a lumber yard and a blacksmith shop. The Farmer’s State Bank opened in 1920 and Shoults Garage opened in 1925. Through the 1920s and 1930s the town became a regional center for commerce in northern Goshen County. Afterward, however, it began to decline as the automobile made it easier for local residents to travel to larger towns like Lusk, Lingle, and Torrington. In 1931, Lake Harris was once again appointed postmaster, a position he held until 1959, when he retired. In 1935, Lake Harris established the Jay Em Stone Company, making tombstones and building products from stone quarried around the Rawhide Buttes. The Farmer’s State Bank sold out in 1945 and Shoults Garage closed the same year. However, the next year, the garage would reopen as “Wolfes Repair,” business that lasted until 1960. The general store lasted until the late 1970s. Lake Harris died in 1983 at the age of 96. 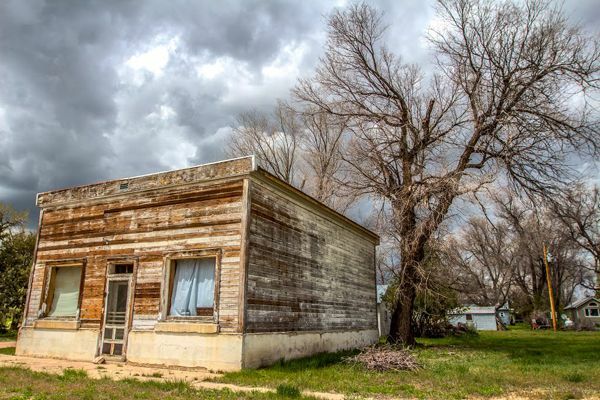 At about the same time, most of the few remaining residents gradually moved to more modern accommodations scattered around the edges of town, eventually leaving the old, historic center of town, for the most part, abandoned. Never incorporated, the streets of Jay Em were never paved or graveled, there were never sidewalks, curbs or gutters, there was no municipal organization or community center. At its largest, Jay Em hosted more than 200 residents. The Jay Em Historic District was listed on the National Register of Historic Places in 1984.